Welcome to the four hundred and sixty-seventh of my blog interviews with novelists, poets, short story authors, biographers, agents, publishers and more. Today’s is with multi-genre author John M Wills. A list of interviewees (blogged and scheduled) can be found here. If you like what you read, please do go and investigate further. Morgen: Hello, John. Please tell us something about yourself. John: I live in Fredericksburg, VA (USA). After retiring from the FBI in 2004, I began my professional writing career. Morgen: I think I can guess the answer to this (as you mentioned the FBI) but what genre do you write? John: I write in a variety of genres. 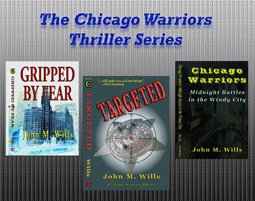 I’ve written three novels, all part of a series I created—THE CHICAGO WARRIORS™ THRILLER SERIES. I have a two-volume non-fiction series entitled, Lessons From The Street. I’ve published more than 125 articles on police training and street survival, and I have had short stories and poetry published in several anthologies. Morgen: Wow. Do you write under a pseudonym for your everything published to-date? John: I use my real name: John M. Wills. 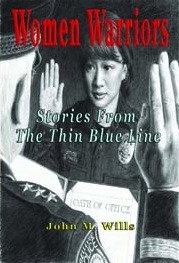 In addition to the above works, I have a non-fiction book due out on September 11, 2012, called, Women Warriors: Stories from the Thin Blue Line. I had a personal essay entitled, “Nothing Left,” published in Hippocampus Magazine on the internet. Morgen: I’ve heard of Hippocampus – interviewees Kim Dalferes and Phillip Ellis have also been published by them. Have you had any rejections? If so, how do you deal with them? John: Book rejections, not yet, but I’m sure they’re in my future at some point. However, I’ve submitted short stories in competitions that didn’t win anything. Morgen: Oh me too… and I’m sure almost everyone else reading this. So you’ve entered competitions, how did you find out about them? John: I’ve entered a bunch, some through a couple of writing groups I belong to, others simply from searching on the internet. John: No agent. I’ve heard stories about the importance of an agent, but after speaking with several writers who have one, I decided I could do just as good a job. Morgen: I’m sure you’re right. So many authors these days (myself included) have tried and hit the proverbial brick wall so are going the self-published / eBook route. Are your books available as eBooks? Were you involved in that process at all? Do you read eBooks or is it paper all the way? John: My books are available as eBooks, on Kindle and Nook. I read both paper and eBook; I’m on my second Kindle. Morgen: Me too. I bought a Kindle 4 then when the Touch came out this April I upgraded (helped by the fact that my best friend had her eye on the 4). 🙂 You said about yourself doing as good a job as an agent, what sort of marketing do you do? John: I do the typical things: social media, website, book signings, bookmarks, etc. One in a while I will get a radio or newspaper interview. I had a very good one for my last release, TARGETED. The Chicago Sun-Times newspaper gave me a whole page in their Entertainment Section. Morgen: Wow. Do you have a favourite of your books or characters? If any of your books were made into films, who would you have as the leading actor/s? John: In my thriller series, my two protagonists are Pete Shannon and Marilyn Benson. I think I’d like to have Christian Bale and Jennifer Love Hewitt. Morgen: Great choices. I’d be happy with those too. Did you have any say in the titles / covers of your books? How important do you think they are? John: Yes, my publisher, TotalRecall Press, worked with me on both the titles and covers. Both elements are extremely important, as they are the first contact with the potential reader. Morgen: Ah, another name I recognise (from Bob Doerr). What are you working on at the moment / next? John: I’m writing a Christmas novel. Morgen: I love reading Christmas books at Christmas (and other times of the year, especially when it’s snowing and we missed out on a white Christmas). Do you manage to write every day? Do you ever suffer from writer’s block? John: I do write something every day, an article, a chapter in a book, book review—something. John: My first novel was an idea and I ran with it. After that, I began to plan my novels, writing down characters and plots, sub-plots and themes. Morgen: Do you have a method for creating your characters and their names? John: Most of the time I just think of them, wanting them to be easy to remember for both myself and the reader. If I need a foreign name, I usually go to the net and use a name generator. Morgen: I love technology. 🙂 Do you write any poetry? If so, why do you think it’s such a difficult market to break into? Are there any tips you could give to someone wishing to write poetry? John: I dabble in poetry; I’ve had a couple published and actually won a couple of awards. I am by no means well versed, but I think it enhances a writer’s ability to write beautifully and concisely. John: I love writing short stories. In the last year or so, I’ve become addicted to writing flash fiction. What a challenge to create a character, story line, conflict and ending, all in under 1,000 words. Morgen: Or under 300 as is often the case in my 5pm fiction slot. 🙂 Do you do a lot of editing or do you find that as time goes on your writing is more fully-formed? John: Not as much as before, but I still do it. What helps me is belonging to a critique group. They are able to spot things I miss. I also have a couple of readers who read the edited manuscript before it goes to the publisher. Morgen: I run or belong to four writing groups; two are purely critique and the other two have some feedback which I find invaluable. As you say, it’s easy for us to miss things. Do you have to do much research? John: Occasionally, but much of my writing has to do with law enforcement related topics. I spent 35 years as a Chicago cop and FBI agent, so I’m very knowledgeable about the subject matter. Morgen: A great brain to pick for other crime / mystery authors. 🙂 What point of view do you find most to your liking: first person or third person? Have you ever tried second person? John: I’ve written in first and third person. I prefer to write in third and have not tried second. Morgen: Third is the most popular, and second least popular. Editors tend to avoid it, which is a shame, but few readers like it and they buy for their readers… but then I like to think that it’s catch-22 where there’s not much there so readers don’t get the opportunity to fall in love with it (as I’ve done). What’s your favourite / least favourite aspect of your writing life? John: Writing technical manuals is tedious. Even though I am retired from the FBI, I work for a training company that takes advantage of my writing skills. John: Write. Read. Write. A very accomplished writer told me early on that you can’t be a good writer unless you read—everything—novels, articles, manuals, a plethora of genres. Then, after you write, get your work out there. Let others read it and critique it. Join writing and critique groups. If you write in solitude and only allow family to critique your work, you’ll hear exactly what you want to hear. Morgen: Unless you run it past my family (brother / mother certainly) they’re very good at pulling it apart. 🙂 If you could invite three people from any era to dinner, who would you choose and what would you cook (or hide the takeaway containers)? John: Gosh, a lot of my writing has a Christian slant to it—anyone from the Bible, any one of the Popes. Morgen: Popular choices. Is there a word, phrase or quote you like? Morgen: Absolutely. I came to writing quite late by comparison (late 30s) and for quite a while wished it had been much earlier but then I reminded myself that I had all those years’ experience. Are you involved in anything else writing-related other than actual writing or marketing of your writing? John: Yes. I write book reviews for the New York Journal of Books, (I am a member of the National Book Critics Circle), I am a public speaker on behalf of the NCAA, talking to student-athletes about the dangers of steroids and other drugs, I write a monthly article for the largest law enforcement site on the internet: www.Officer.com. I’m also a freelance writer, so I occasionally pick up different writing jobs. Morgen: Ooh great, perhaps I could add you as a book reviewer on my reviews page. What do you do when you’re not writing? John: My job as a law enforcement trainer has me travelling around North America, but when I’m home I spend as much time as I can with my wife and four grandkids. John: I like to use the Random Name Generator http://www.kleimo.com/random/name.cfm and http://www.Dictionary.com. Morgen: I’d not come across that generator before but it’s great… first and surnames. Lauren Gobbo stuck out at me. Are you on any forums or networking sites? John: Facebook, Twitter and Linkedin. John: Writers rarely ever get rich, many barely make a living. Writers are what they are because they love to write. When I receive an email from someone who has read my work, that’s the greatest reward I can think of. Morgen: Me too. I had one a little while ago from a <13-year-old saying she loved my free eShort April’s Fool and wanted to know what happened next. I’d not thought of it and haven’t written one yet although I did later write a prequel (Once the love’s gone) as one of my daily shorts. Where can we find out about you and your work? John: I have a website, www.johnmwills.com, or you can Google my name, John M. Wills, or go to Amazon and find my books, or at my publisher, TotalRecall Press. John: My next book release, Women Warriors: Stories from the Thin Blue Line, is due out on September 11, 2012. It features a compelling collection of stories about women in law enforcement. From a dispatcher on the radio trying to remain calm and do her job while her husband is involved in a gun battle, to a desperate search for a missing child during a frightening storm, to a courageous lone officer staring down the barrel of a gun inside a crowded department store, the tales in this book will have your pulse racing. Police officers, federal agents, chaplains, corrections officers and dispatchers all share their stories, each one written in their own hand. The diverse tales will make you laugh, cry and cheer as these Women Warriors face unknown danger during their shifts. From the red-hot streets of Texas, to the frozen Alaska tundra, these true stories will capture your imagination and give you a true sense of what today’s women encounter as part of the Thin Blue Line. 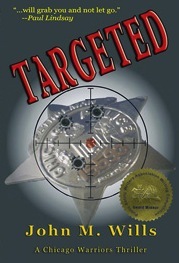 TARGETED (1st Place Fiction Novel at the PSWA Conference) features Chicago Police Detectives Pete Shannon and Marilyn Benson who are thrust into a homicide investigation, taking them away from the Violent Crimes Unit where they are normally assigned. A crazed gunman has been randomly targeting cops for his own deranged satisfaction. The duo finds themselves teamed with a pair of old-timers who do their best to interfere with the detectives’ leads and make their lives miserable. The hunt for the serial killer becomes a life-altering experience for the partners as they face individual challenges that threaten to destroy them. At the same time, Father Ed Matthews, a Catholic priest, has been accused of for child molestation at the southwest side parish where he’s assigned. Pete and Marilyn arrest him, but as the priest begins his journey through the Chicago judicial system, he flees the city and becomes a fugitive. He begins a journey away from the priesthood, from which he may never return. 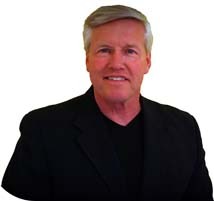 John M. Wills is a former Chicago police officer and retired FBI agent. His thirty-three years in law enforcement have included working violent crime, drugs, undercover assignments, and teaching street survival internationally. Having spent most of his career as a SWAT team member, firearms and tactical instructor, John has the ability to immerse the reader in life-like situations. He was awarded two of the Chicago Police Department’s highest commendations for Valor, and ended his career teaching at the FBI Academy in Quantico, Virginia. He has published more than 125 articles on police training, firearms, and officer survival. John lives with his wife of 42 years, Christine. They have been blessed with three fantastic children and four marvelous grandchildren. Contact John via www.johnmwills.com. Update December 2012: Women Warriors is now available in print and ebook. It is also being sold at the National Law Enforcement Memorial in Washington, D.C. in both their Gift Shop, and via their Christmas catalogue. I just published a new anthology, using Kindle Direct Publishing (KDP), The Nightstand Collection, which features prose and poetry. The short stories are both fiction and non-fiction, based on actual events. For my fellow authors, KDP proved to be a simple process to publishing my work. The best part of publishing through KDP is the royalty structure: 70% of the sale goes to the author, and your work is sold world-wide through Amazon. Morgen: KDP’s great. I receive 70% on my chick-lit novel because it’s priced at $2.99, the author only gets 35% if it’s below this. See here for more information. Thank you, John. 10 free iTunes downloads of Jane Wenham-Jones’ Prime Time to be won! Great interview, Morgen. I’m privileged to know John and it was great to learn more about him. He’s a super guy and his book are very exciting! Thank you for your comment, Marilyn. Lovely to hear from you and I’m delighted you enjoyed the interview. Marilyn, thank you, you are too kind.